The phrase "tote-bag hell" was first coined during the 1970s for those interminable weeks when public television programming was interrupted every six minutes to beg the viewers to pledge money. In exchange, the pledger received a "token of appreciation" - a tote bag or a coffee mug. Tote bags and coffee mugs are now apparently passe - instead, the lucky donor gets a CD/DVD of Live from the Andorra Opera House, Peter Lemongello Salutes Allan Sherman! Even a die-hard Peter Lemongello fan must surely be aware that no matter how shiny and new that DVD may be, it's just an enticement to get you to send money for the greater good. There's been a restaurant of some kind in the courtyard of the Hartnell Castle for many years. Femme de Joie knows she dined there a few times, but it was so unmemorable she cannot recall now if it was Mexican, Chinese, or what. Savory Spoon opened in that oft-abandoned spot in late 2011. M. de Joie immediately filed it away in her soon-to-close-due-to-bad-location file cabinet. But it didn't close; it prospered and grew from being open three days a week to six days. Good things were heard about the food and the pay-what-you-can Mondays. It was time to drive east on Hartnell to visit. The dining room features perhaps 20 small tables (no booths) topped with butcher paper; a cup of crayons is provided. 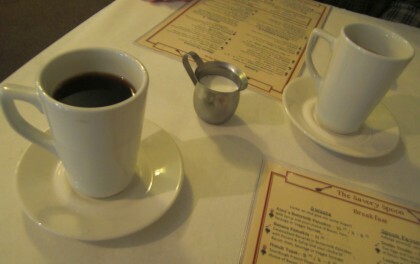 Also on the tables are small pepper grinders and salt grinders - a very nice touch. Collections of vintage menus and kitchen tools make more interesting wall decor than the usual starving-artist paintings found in small cafes. It was perhaps half-full and not crowded on any of our visits. M. de Joie was surprised at how varied Savory Spoon's menu is. There are numerous vegan options (including seitan) as well as gluten-free dishes (though Femme de Joie did not ask whether cross-contamination measures are taken). When vegetarian meat substitutes were first widely available, most of them were on the disgusting side. M. de Joie remembers a booth at the Shasta District Fair circa 1970 that was handing out fake steak bites. She has blocked out exactly how nasty that bite was. 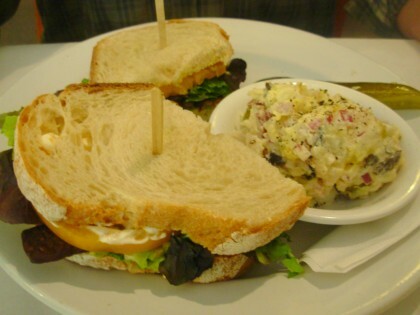 There's been a lot of progress since then, and this sandwich was a good example. Crisp and smoky veg bacon stood in for the real porker product. Matched with local tomatoes and buttery avocados, this was a healthier take on the classic with a strong resemblance to the real thing. On the side, potato salad was good enough to be compared to homemade - this definitely did not come off the Sysco truck. However good the food was, we did expect more food for $11.00. It's easy for most restaurants to offer a veggie burger by just defrosting a Boca or Garden burger, but kudos go to anyone who makes their own. The Monte Meat burger had a meat-like texture (it held together rather than falling into sorry lumps like many veggie burgers do) and taste (though again, it isn't going to be mistaken for ground chuck). Femme de Joie was rather taken aback at the size, reminiscent of a kiddie burger at a fast-food place, though the homegrown yellow tomato soothed some of the disappointment. Chipotle sauce was very mild and bland. 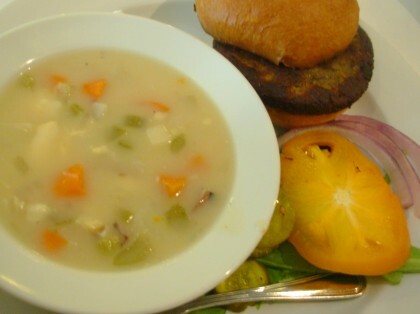 Cod chowder was full of vegetables but a bit short on actual cod, though it had the fishy taste of a cod swimming in the cauldron. Savory Spoon uses a lot of local food purveyors, including coffee from Strawhouse on Highway 299 at Big Flat. Why would you get coffee from a wide spot in the road on your way to the coast? Because this is exceptionally good coffee and worth the extra trouble. 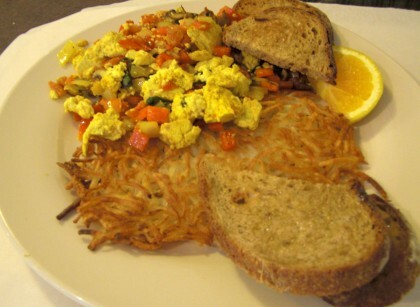 It isn't that easy to find a really good breakfast in Redding, but Savory Spoon does them right. 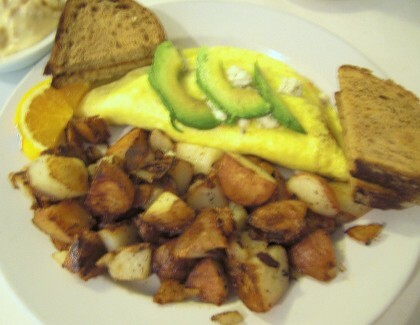 A tender omelet with a harmonious combination of fillings (blue cheese on an omelet? Yes, please) was the centerpiece. Red house potatoes were a delight - not burned or underdone or out of a freezer bag, seasoned lightly, they made the plate complete. Rye bread from The Oven Bakery in Mount Shasta was a surprise - toast is often just on the side to take up room, but fine rye bread is actually worth eating. A nice touch was jam served in tiny bowls rather than the peel-away plastic tubs. 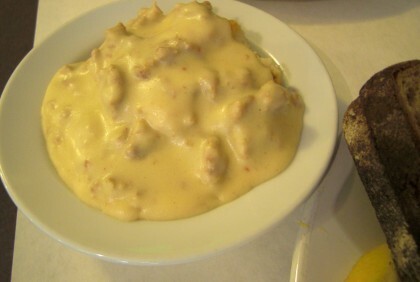 House-made sausage gravy isn't on the dieter's list, but this gravy was worth at least a taste or two. Not overly salty or greasy, creamy gravy had plenty of sausage bits (unfortunately, a bit of gristle too). It would have been nice to have the gravy served on the side rather than poured over the biscuit so the biscuit could have remained unsoggy. Scrambled tofu? It's been a staple of vegetarian & vegan breakfasts for years, and is worth exploring if you're looking for a low-fat alternative to eggs. Colored with turmeric to look like eggs, tofu takes on the taste of whatever it's cooked with. This was a pleasing mix of vegetables with soft tofu curds. It's been a mission of Amico del Signore to find really great hash browns, and these were pretty close to potato Nirvana: very crisp, nongreasy house-made shreds of browned potatoes. The food is delicious with so many nice touches, and the undertaking of the Savory Spoon is noble and in line with everything M. de Joie agrees with. It is located in an underserved area for restaurants and also attempts to serve the disenfranchised population. Savory Spoon has so many good things about it - ingredients sourced from local purveyors, dedication to high-quality organic foods, gluten-free and vegan options, a pay-what-you-can day on Monday for the poor & indigent. Having said all of that, Femme de Joie found this to be by far the most difficult review she has ever written.She walked out of Savory Spoon feeling uneasy, unsettled about some niggling little discrepancy, something that just wasn't sitting well with her. It finally came to her, not in an enlightening moment of shimmering clarity, but after hours of boring Amico del Signore with existential questions and general angst. It's the pricing. Take the coffee, Morning Blend, retailing at Strawhouse for $13.00/pound. It is very good coffee and a very good deal at $2.50. But Cheesecakes Unlimited in Redding serves coffee for $2.79, Clearie's for $4.00, a French press of coffee (2-3 cups) at Moonstone costs $5.95. Wines: Savory Spoon has a nice selection of primarily local wines. A bottle of Burnsini 2009 Tehama Red sells for $24.00 at Vintage Wine Bar but $18.00 at Savory Spoon. The food pricing seems askew: a large spaghetti lunch (including garlic bread but not soup or salad) costs $15.00 but a 1/3 pound Prather Ranch bacon cheeseburger (including a choice of sides) is priced at $12.50. Chicken and dumplings at dinner is $15.00, more than meatloaf ($14.50). And at breakfast, a bowl of cream of wheat or oatmeal seems sky-high at $7.00, compared to an English muffin with meat, Cheddar, and a fried egg for $5.00. Should a seitan sandwich cost more than a Reuben? Why do inexpensive pasta and chicken cost more than beef? Why is a simple bowl of hot cereal more than a ham-egg-cheese breakfast sandwich? M. de Joie wondered what's wrong with the chicken if the pasta costs more? Why do pancakes cost more than an omelet? There must be something she is missing here. It would seem logical to her that a nonprofit restaurant capitalize on the same things that for-profit restaurants make money on - i.e. the huge markup in beverages - so that the other menu items are not so far out of line with other restaurant menu pricing. Does getting a cup of coffee for $2.50 make up for a seven dollar bowl of oatmeal? At what point does "It's for a good cause" trump actual value? Like the DVD sent out by PBS in exchange for a donation of $120, is it enough to keep people coming back for more, or will it eventually dissuade consumers? These are questions M. de Joie does not have a satisfactory answer to, but thus far the customer base seems quite happy with the food at Savory Spoon - and in the end, that is what will keep it alive.